Grass fields and lawns need regular cares and cutting to be in good condition and develop properly. We can offer you our reliable and effective grass cutting services to maintain your green areas in Acton, W3 well shaped. Our gardening specialists can reduce the height of your lawns and provide regular grass maintenance. They use high-end machines for mowing large and small grass fields. Thanks to the knowledge, skills and expertise they have, the lawn and garden will be shaped and edged to suit the whole appearance of the property. Our gardeners will create a striped grass layout which will provoke the growth of your lawn. Regularly and effectively cut grass fields look better and become thicker. This is as a result of developing stronger root systems which don’t permit the growing of weeds and make the whole lawn denser. 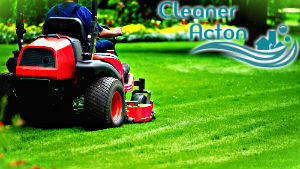 If you use our grass cutting services oftener you won’t have bare areas and moss in your lawns. Our gardening experts will advice you when and how often your garden grass areas need to be mown. They can do the work qualitatively using powerful mowers which collect the cuttings and help us dispose of them. Rely on our company to offer you outstanding grass cutting to make your property’s green areas in W3 shaped and presentable. If you leave your lawn to become too high and overgrown with weeds it will get thinner and look unsightly. By regular using of our grass cutting services, provided in Acton, you will receive the best possible cares for your green fields and lawns. Include other gardening service to the grass cutting and you will receive a discount on the price. For more information and booking an appointment with our gardeners contact our call centre.